Renovating your living or work space can be a big project. Luckily, you have the team at Burkholder’s Flooring America to help make the process much easier. We’ll help you sort through your flooring options and choose the one that’s perfect for your practical needs and aesthetic preferences. If you haven’t been shopping for flooring in several years, you may not realize the value luxury vinyl plank and tile floors can offer. They’re not just resilient and durable--they’re also incredibly versatile. Available in a wide range of styles, there’s no limit to the beauty you can bring to your space. To help you optimize all the benefits vinyl has to offer, we supply the top brands on the market. As a Karndean authorized dealer in Hagerstown, MD, our company is the place to turn to when you want water-resistant, long-lasting floors. Each type of flooring material has its own advantages. Luxury vinyl is no different. Because it’s available in both plank and tile options, you can choose designs that mimic the look of hardwood or stone tile. Unlike these other hard-surface materials, vinyl is soft underfoot and makes it perfect for playrooms, kitchens, and other rooms where you’re on your feet a lot. 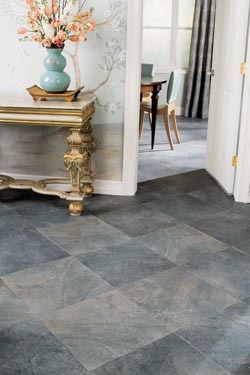 At our showroom, you’ll find a whole line of Karndean waterproof flooring. This vinyl is perfectly crafted to repel moisture so you don’t have to worry about mold, mildew, or water damage. So whether you want comfortable floors for your living room or waterproof flooring for your bathroom, our vinyl is the perfect choice. When you turn to us for luxury vinyl tile or plank floors, you’re not alone in the decision-making process. Our design staff has the expertise to help you choose the right materials and style for your space. We also have an in-house team of installers that can optimize the beauty and performance of your new floors. Visit our showroom to start browsing our inventory. Contact us to learn more about our selection of luxury vinyl flooring. We proudly serve customers in Hagerstown, Smithsburg, Greencastle, Boonsboro, and Waynesboro as well as the surrounding communities.